Rachel and Alice are an extremely rare kind of identical twins-so identical that even their aunt and uncle, whom they've lived with since their parents passed away, can't tell them apart. But the sisters are connected in a way that goes well beyond their surfaces: when one experiences pain, the other exhibits the exact same signs of distress. 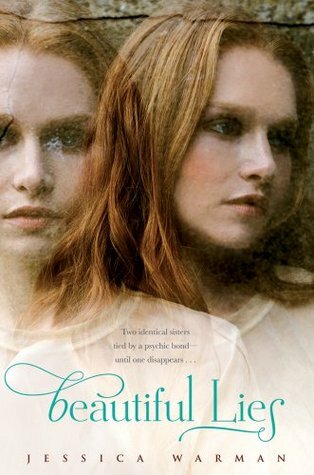 So when one twin mysteriously disappears, the other immediately knows something is wrong-especially when she starts experiencing serious physical traumas, despite the fact that nobody has touched her. As the search commences to find her sister, the twin left behind must rely on their intense bond to uncover the truth. But is there anyone around her she can trust, when everyone could be a suspect? And ultimately, can she even trust herself? My introduction to Jessica Warman was Between, bought and read last year. Beautiful Lies was bought as a result of both of us liking Between. But I didn't read it last year, I kept it on my shelf for more than a year and it was only during the Christmas holidays that I decided to read as part of my marathon and it kept me occupied and entertained for two days. You can sense the anguish of twin who was left behind, having totally 'lost' her sister for the first time in her life. Lost her as in not able to feel the connection that can always be felt between Rachel and Alice. The author just did such a good job in keeping the suspense throughout the book without giving away the plot that at the end when the truth was revealed, it was rather epic and mind blowing. While this is a YA genre, it doesn't really matter. I love it just the same. I think this book is a keeper. It earned a place back in my self together with Between. In the meantime, let me go and check if there's other titles by this author.